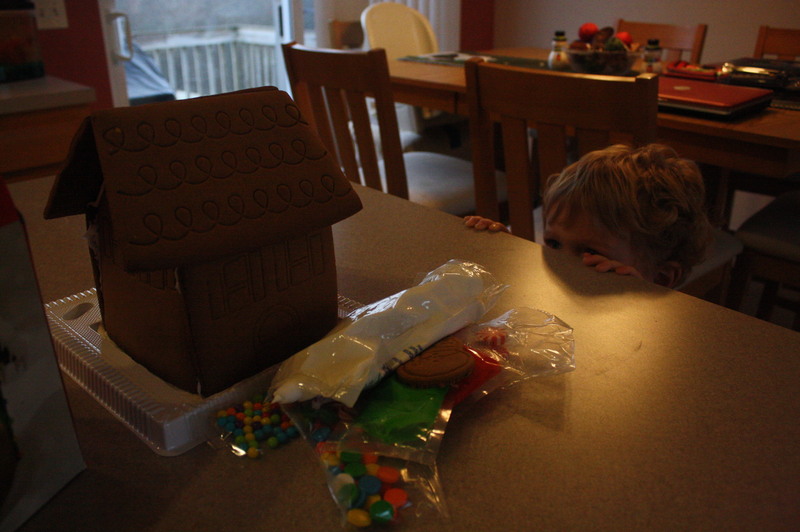 I was warned that building a Ginger Bread House with a toddler was a sure recipe for tantrums and frustration. I was told to have zero expectations except that of a mess. So I put the expectation bar on the floor. this is what the finished product should look like? hmmm...not likely. 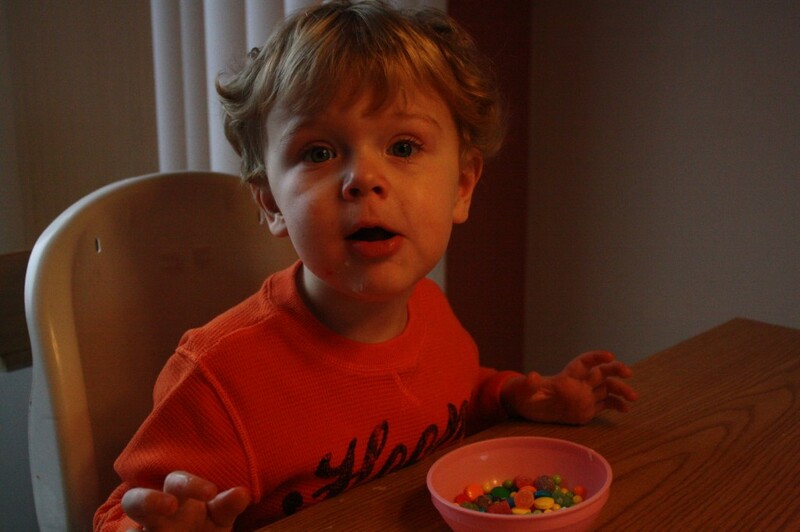 moments after he yelled, "be ca-ful, mommy!" a thousand times while I frosted the roof for him. 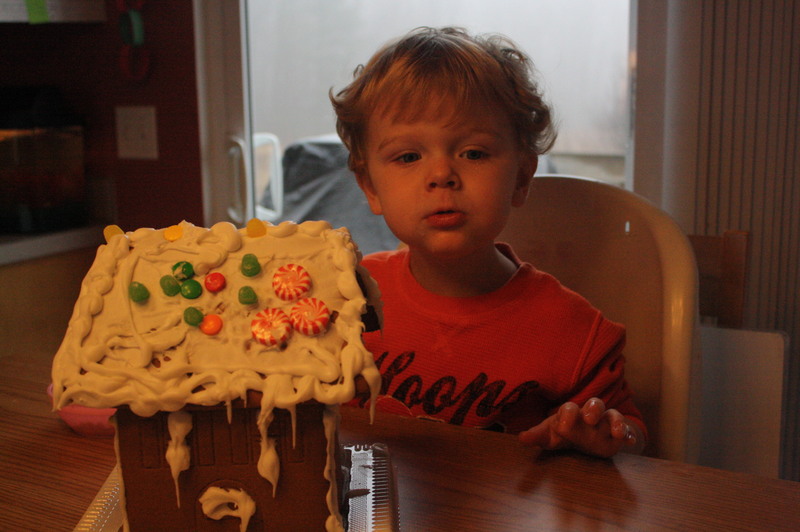 as you can see, he wanted me to get in and out with that frosting and not fix a thing. Whatever you say, little dude. Also? He is probably giving me MORE instructions as I take this picture. "hurry up mom, I don't have time for pictures. You need to bust out the red and green frosting already." "I have no idea what you are talking about, mommy." 1. My toddler is a control freak. 2. He is more careful than most adults when it comes to placing candy on houses. 3. He would probably give his right foot for candy. 4. We can do crafty things without tantrums and freak outs. What crafty things have you done to keep your kid from driving you crazy entertain your child(ren) this holiday season? wow. And it stayed pretty clean. I actually bought myself one to decorate because my crazy controlling ways would want it JUST SO. Though, they can do theirs any way they want. We have one of those and I’m totally scared about it LOL! We’ll be doing ours tomorrow night. Yours looks great! Every single time I go shopping I forget to pick up the damn house. We’re making sugar cookies today and gingerbread men. PS. I want to eat Eddie. Too cute for words. 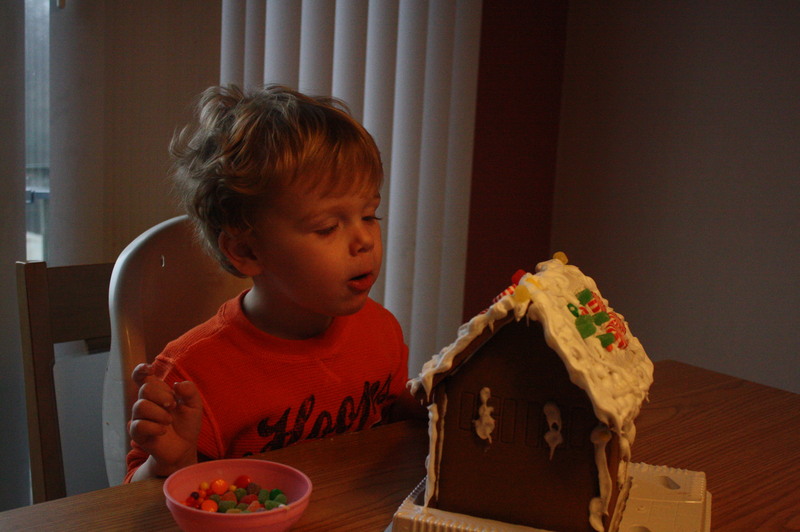 We looked at a gingerbread house with my two (mind you, mine are younger than your toddler) and all they wanted to do was break the candy off the roof . . . next year, maybe, we’ll start. That is a VERY fine house indeed! Every year for the past 3 years we invite DD’s ( now 8y/o) friends over to decorate individual gingerbread houses that they get to take home with them. Some years we even paint Christmas decorations. Needless to say I’ve learned to drop sheet the floor with a few of those disposable painting drop clothes. That’s a great looking house! 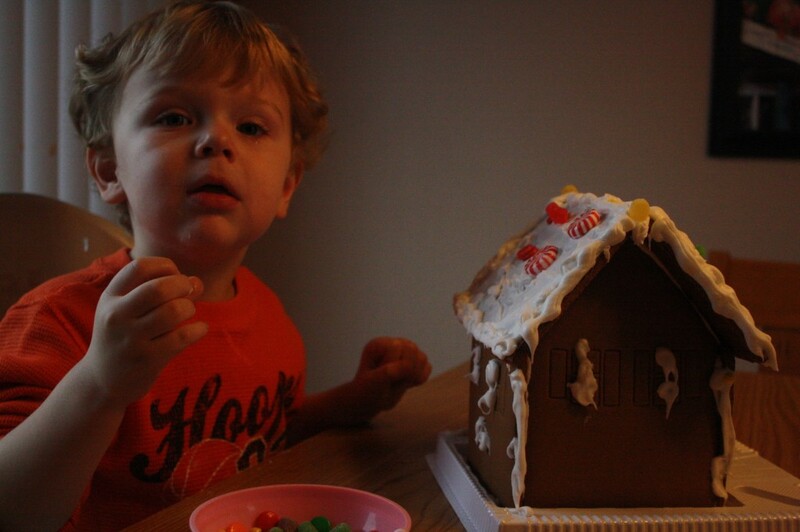 I took my kids to my aunt’s house a few years ago to make gingerbread houses. It was a lot of fun, but oh so messy! The following year we decorated gingerbread trees. Much easier and less messy. This year we made ornaments out of q-tips, glue, and glitter. They turned out great but saying getting to the end was easy would be a lie. That is so cute (the boy and the house)! I was happy to be able to go help my son’s kindergarten class make their gingerbread houses. If we tried it at home, we’d also have a 2yo and 4yo building them at the same time. I don’t think I could handle three at once! And the house is perfection. We haven’t tackled this year’s house yet…it’s on our to do list for today. It would seem as though he did a great job and so did you, mama! 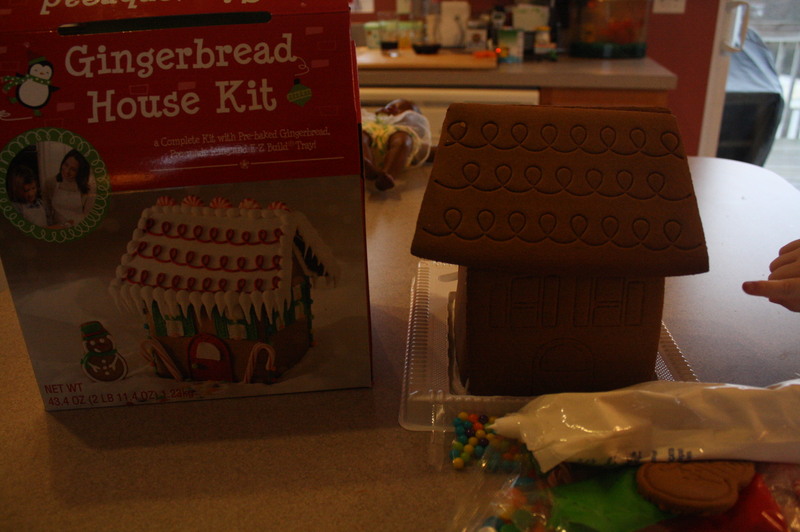 We did mini gingerbread houses (which are harder to build in my eyes than the normal size ones. I had one for each of us (three) and we all decorated, though Alexa was content to watch for the most part. We also made a Santa head out of construction paper that hangs on the fridge. I had some lofty crafty xmas goals but only got a few in this year. Ah, she’s not quite 3 yet, next year will be more awesome for kid crafts! 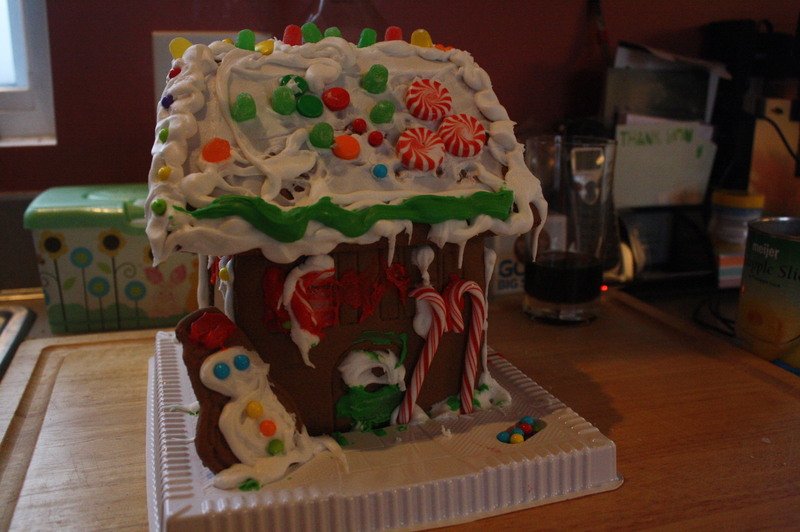 Sad truth: That really doesn’t look so different from the gingerbread house my husband and I made a few years ago. 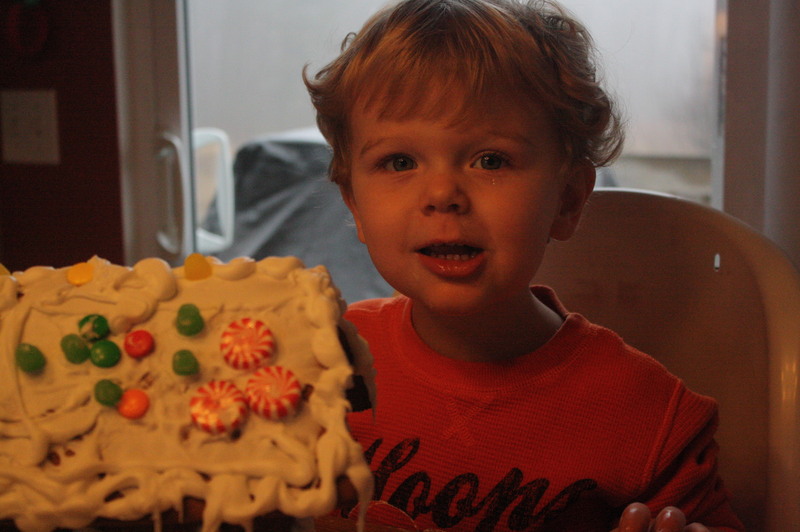 Eddie one-upped us in the gingerbread house department. lmao, that last picture totally looks like one of your facial expressions!